Maybe it's TMCI. 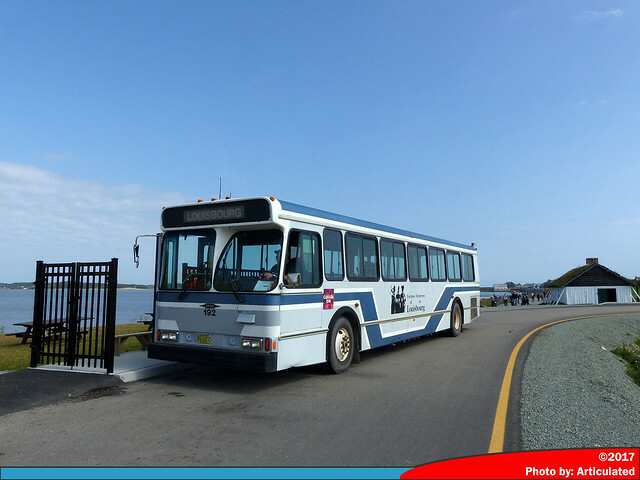 I remember that when I went to Louisbourg, the Classic I rode had emergency exit stickers in English and Spanish. Ah the ex-Dupont Demo. I believe this unit was once painted in a purple scheme. It was a spare at the time when we visited the Fortress and they only had the two V's running. This unit could also possibly be an MCI, I have a feeling it could be an ex-UTA unit. Guys, that bus is a GM Classic and is definately an Ex-UTA Classic from Salt Lake City. all the specs on it point to a GM Classic from about 1983, 1984 from Salt Lake. It even still has GM Classic doors on it. Thanks for the confirmation Peter. The front stairwell is what led me to believe that the unit was an ex-UTA unit. The V`s were #`s 191 and 192. I know they had an Orion 1 that was leased. Here`s a pic of an orion 1 in the old livery. 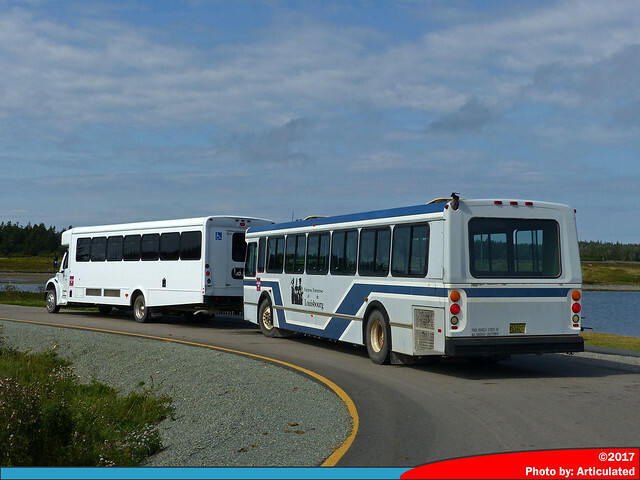 My wife and I visited Fortress Louisbourg on August 11 and rode MCI 8305 and Orion V 191 and spotted Orion V 192. They are excellent shape because they are only use for summer. 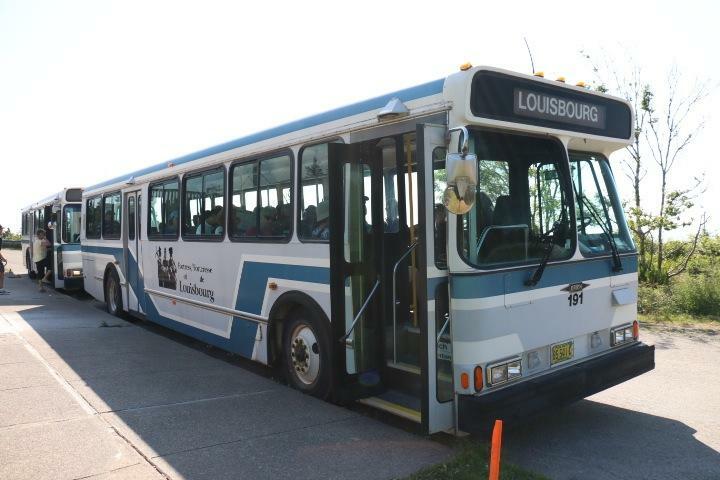 i'm going down to Cape Breton this summer hopefully and if i get the chance, hopefully go to Louisbourg and check out the Classic, do all three buses run at the same time or just two? 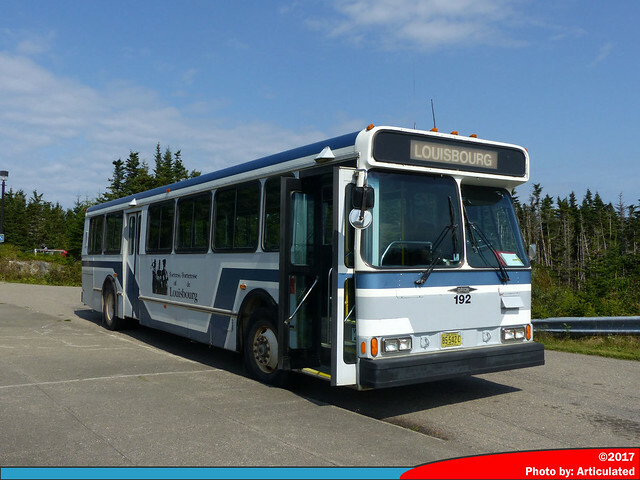 That was the bus I was on during my trips to the Fortress of Louisbourg...I haven't been back there since 1990. BTW, the above link is dead. That links been dead since fotopic went dry. I will find a pic of her im sure theres one somewhere. Does anyone know the years of 191 and 192? 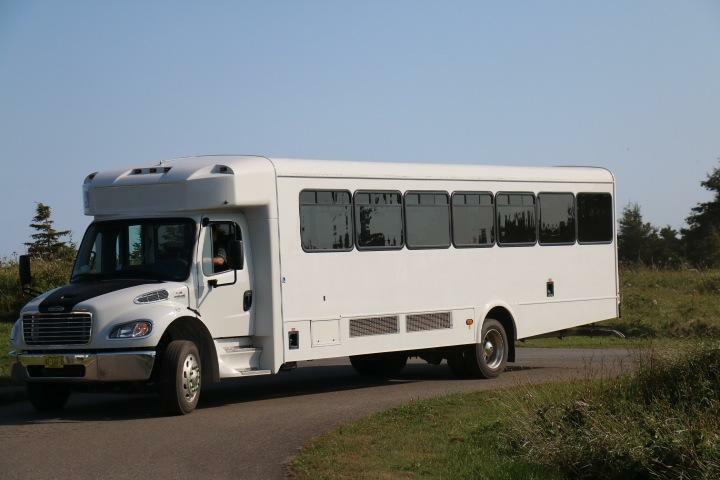 My parents came back from a visit to Nova Scotia, and as per my request they snapped a few pics of the parking shuttle buses. The 1992 Orion Vs 191 and 192 are still going strong holding down the service. It looks like the ex-UTA GM Classic has been replaced by a fairly new Glaval Bus Legacy cutaway which came out to help handle the closing-time crowds. 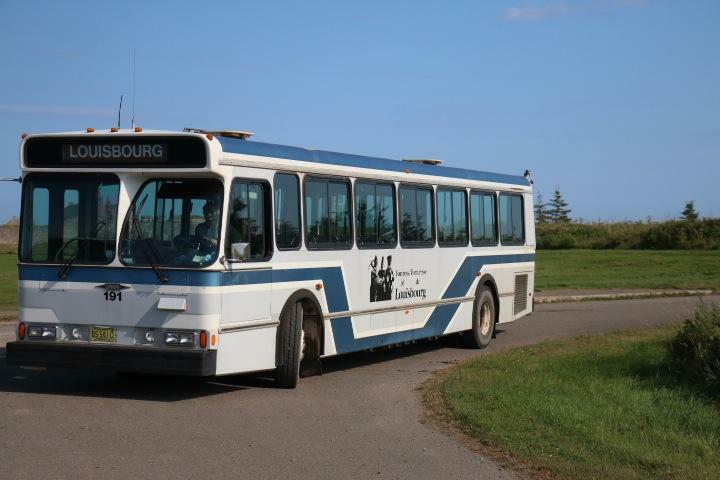 Here it is...at long last, a pic of an old Orion I transit bus at the Fortress of Louisbourg, powered by a painfully loud Detroit Diesel 6V53! Wow, been many years since I last saw those Orion's . 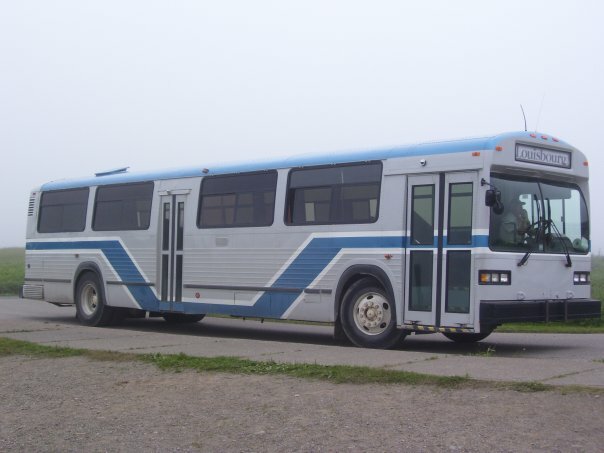 The Gillis family made money for years with those units, first running them as Aerocoach units, then the fortress work and a few of them licensed for charter work under Acadian Lines and Nova Charter Service. Was sad to see most of them rotting away in the back yard around '95 and very happy to see them on the highway headed through Moncton a year later as they headed to new owners. I apologize for the bump. Great to know and thanks for the info, but why is your post formatted weirdly? I had to carefully read because it was so weirdly formatted. There is an option in the comment box to change the justification of the post; his post happens to be right-justified. Unusual but not a big issue. Anyway since I'm already posting here, might as well make it useful... Paid a visit to Fortress of Louisbourg on September 17th, at the tail end of the season. 192 and the Glaval Legacy were operating on the shuttle that day. The shuttle route takes approximately 5-6 minutes each way between the Visitor's Centre and the loop outside the Fortress, with buses leaving every 15 minutes from the Visitor's Centre, which mean they pretty much bump each other out. For an overload situation, both buses leave at once, with the first bus returning to the Visitor's Centre immediately and performing the next scheduled trip. The Glaval Legacy still does not appear to be officially numbered; however, there is a number of 17710 handwritten where the rear license plate would normally go, so I guess this is its fleet number. Inside, all of the seats are low-back leather seats with seatbelts. Nice V you have in the photo. I can tell it's an older model, guessing 1992-1995? 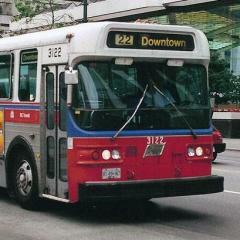 Wish our OC Transpo 1991/1992 Vs lasted that long. The Fortress of Louisbourg Orion Vs are 1992 models. 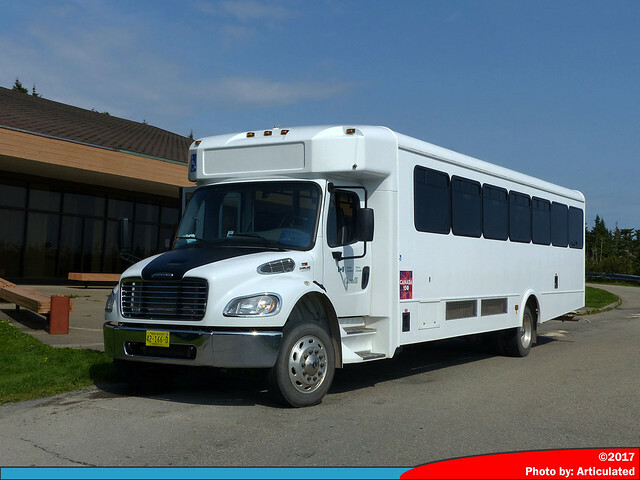 They are only used for a few months of the year; therefore, they do not get as many kilometres as a regular transit bus, and they do not operate in winter weather either, which helps prolong their life significantly. I get it, thanks. It makes sense. Do you know why they would only be used for a few months in a year? ...because the Fortress is a tourist attraction...? 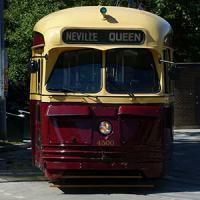 This isn't a public transit service here. 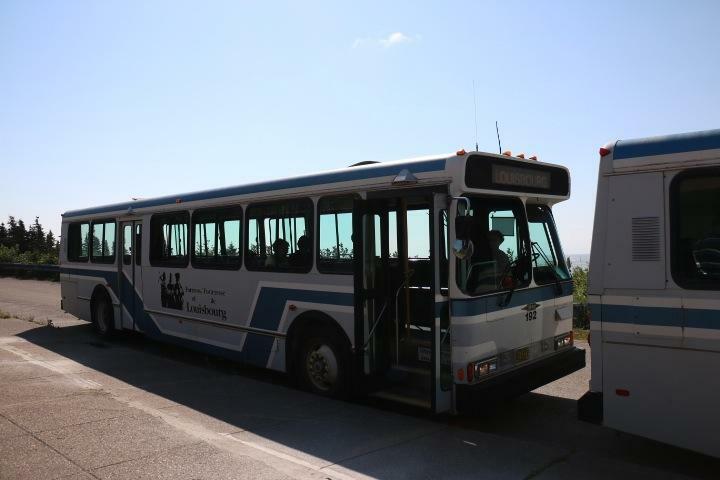 The only purpose of the buses is to shuttle people from the parking lots at the Visitor's Centre to the gates of the Fortress. There is a small gravel parking lot beside the museum in the Fortress but it cannot handle the crowds during the peak summer season; during the off season it's sufficient enough to handle the lower volume of visitors. 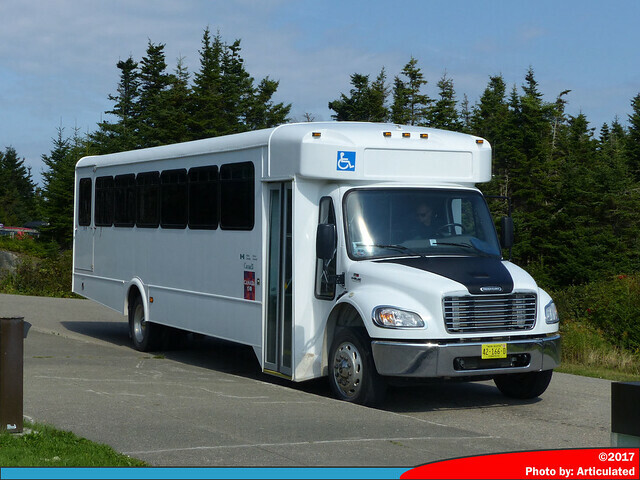 I strongly suggest checking out the Fortress of Louisbourg National Historic Site website for more details on the bus service and why it only operates during certain times of the year.